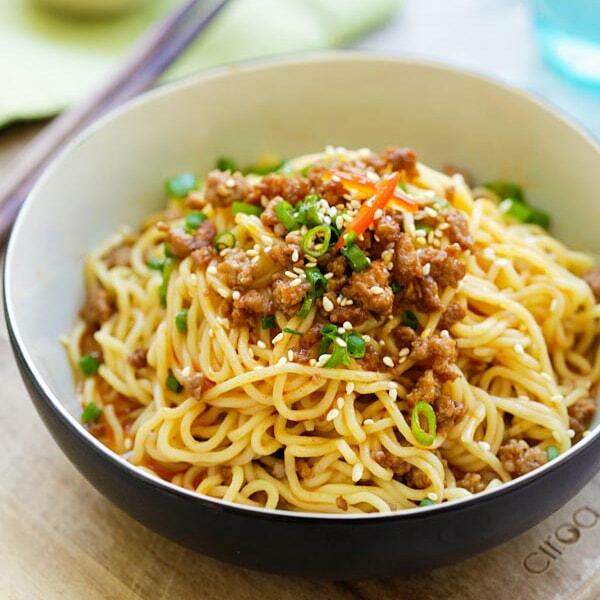 Dan Dan Noodles - Savory and spicy Sichuan noodles served with ground meat make for a delicious meal at home. Learn how to make it with this easy recipe. Dan Dan Noodles, otherwise known as Dan Dan Mian, originate from Sichuan, China, and it has since become popular all over the world. Sichuan, also spelled as Szechuan, is the birthplace of many Chinese foods we love: kung pao chicken, kung pao shrimp, hot and sour soup, etc. 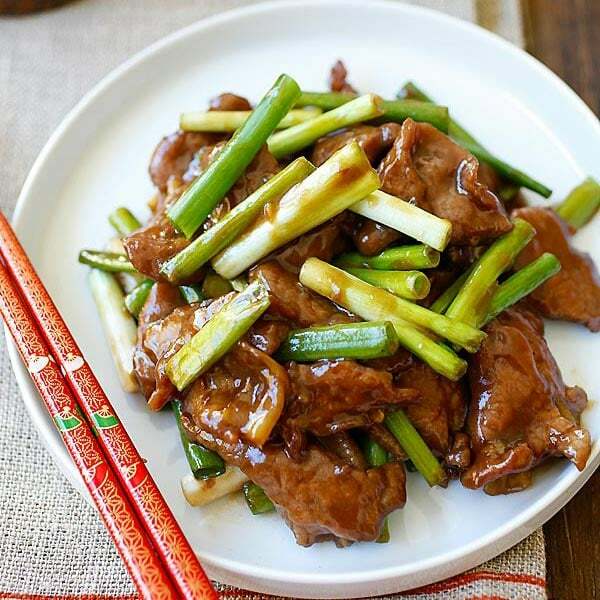 Sichuan cooking is famous for its intense and deep flavors. I have tried many versions of Dan Dan Noodles, but the ones I have tried in Sichuan linger. Unlike the usual watered down versions, these noodles should be extremely flavorful, savory, nutty, spicy, and slightly sharp tasting. 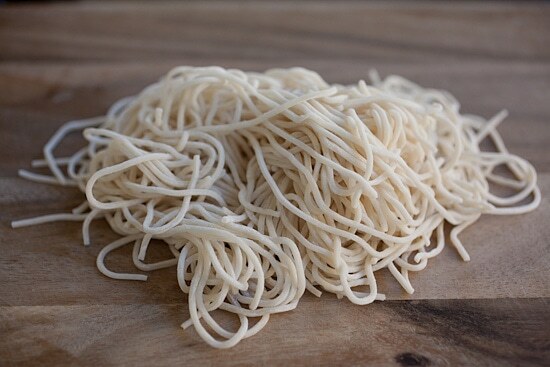 Read on to find out more about these noodles. What Does Dan Dan Mean in Chinese? Interesting fact: The original use of “dan dan” refers to the pole that vendors would use to sell this dish to others on the street. The dish was extremely affordable and the people gradually began to call the noodles “dan dan noodles” to refer to the pole. Dan Dan Noodles can be served dry or with soup, and some variations call for sesame paste and/or peanut butter. This specific recipe is served dry. These noodles are so good that there are regional variations in Japan and Korea. My recipe calls for Mizkan brand condiments. It’s absolutely delicious and authentic, and I am sure you will love it! Disclaimer: This is a sponsored post using Mizkan condiments. Dan Dan Noodles - savory and spicy Sichuan noodles with ground meat. Dan Dan Mian (Noodles) is delicious. Learn how to make it with this easy recipe. Bring a pot of water to boil. Cook the fresh noodles until al dente, drained, briefly rinsed with cold water and set aside. You can get fresh noodles like the above at Asian markets. Mix the ground pork with salt, sesame oil, white pepper, and half of the chopped scallion. Set aside. Leave the other half of the scallion for garnishing. Prepare the chili oil first by heating up a small pot on high heat. Add the oil and heat up the oil until it becomes very hot. Turn off the heat and add the red chili flakes and Sichuan peppercorns into the oil. Cover the pot with its lid immediately as the oil will splatter. Wait for 5 minutes before removing the lid. Filter the chili oil using the filter. 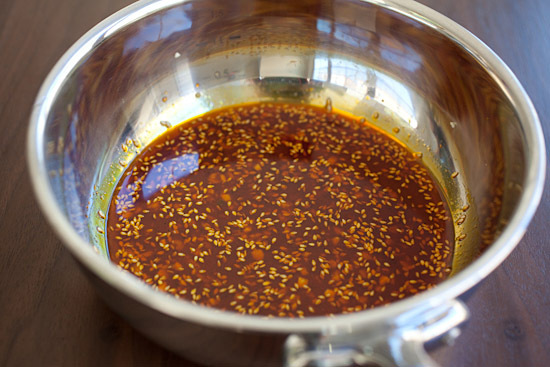 Prepare the Sauce by combining the Chili Oil and all the ingredients in the Sauce together. Whisk it to mix well. 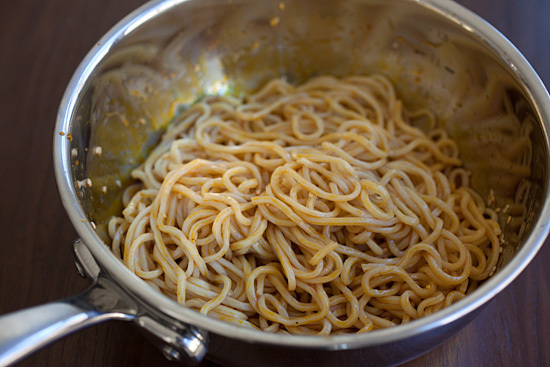 Transfer the noodles into the sauce pan, stir to combine well with the Sauce. To cook the ground pork, add 1 tablespoon of oil into a fry pan. When the oil is heated, add the ground pork into the pan and stir continuously to break up the lumps. Cook for 2-3 minutes or until the ground pork is cooked. Transfer the ground pork to the Dian Dian Mian and mix well. Transfer the noodles into two bowls. Top with some ground peanuts, scallions, and fresh red chilies. Serve immediately. 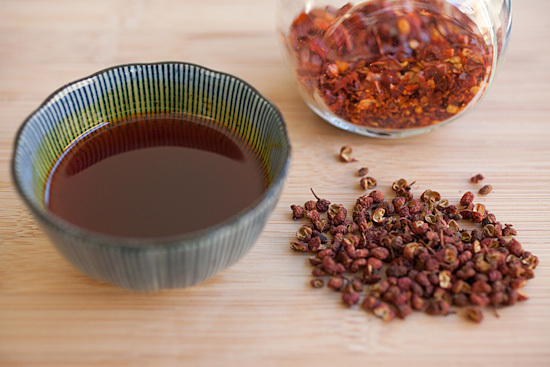 If you don't like the flavor and tingly sensation of Sichuan peppercorn, you can omit it from the Chili Oil. You can buy store-bought red chili oil or "La Yu" for this recipe. Just use about 4 tablespoons or according to your liking and taste. Thanks so much for sharing this recipe. I’ll have to give it all a try with gluten free pasta. Comfort food. I need one bowl so badly now. With a blanket of snow of the ground, we need all the comfort food we can get here in Buffalo, NY! I mean, this looks better than Ramon noodles and it doesn’t get any better than that. Is this the same as dandan noodles? Looks delicious. Yes it’s the same. Mian means noodles in Chinese language. Where can one get Sichuan peppercorns? I looked for them in Ranch 99 Markets here in the bay area and did’t see them. Will I get them in China town? or Whole Foods perhaps? Thanks for posting awesome recipes btw!! Yes, I think you can get them in Chinatown. I found them at Ranch 99 markets here in SoCal. Thank you for your wonderful assortment of Asian recipes! I’m having some difficulty finding your ingredients here, in San Francisco. I usually shop at the Mai Wah Market on Clement St. Though I believe there are other locations where I can find your products here, but I’m lost! Any suggestions? Hi Sherman, you are find Mizkan products at Japanese stores…or the bigger Asian stores like 99 Ranch. I have no problem getting them at 99 Ranch. Are these similar to chow mein noodles or ramen noodles?? I live near a Ranch 99 and a Japanese market. Is there a ingredient on the package I should be looking for to make these noodes?? I don’t remember seeing anything like this that isn’t ramen or chow mein. Thanks! Im anxious to try this recipe. 99 Ranch should have fresh noodles called Shanghai noodles. Get the thin ones. I have made this recipe twice now, once with ground beef and once with ground turkey. IMHO, the sauce came out too sweet for beef…but is was just about right for turkey. I did leave out the extra sugar the second time I made it and added a little extra vinegar. I live in a city in Eastern Europe where it is sometimes difficult to find specialty ingredients for Asian cooking. I love the “Mizkan pantry” idea and brought back a whole set of sauces and condiments in my suitcase the last time I went home. All this recipe required in addition to the Mizkan sauces were some basic food items to make a great, fast meal. I have also made some of the bento dinners when our kitchen is in an Asian mood. 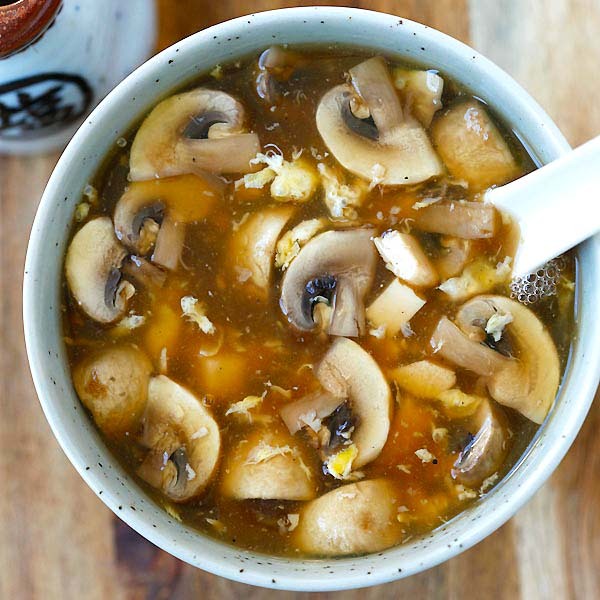 Tamar, that’s so great that you tried this recipe and make Mizkan as your all-Asian sauces! Thank you. Do you have a YouTube chanel? Dan Dan Noodles are a childhood favorite! I saw your pictures and my stomach immediately made a loud grumble. This looks so amazing! I can just imagine how the sauce sits on your lips for a moment as you slurp up the noodles. And I love the mouth tingling/numbing Sichuan peppercorns. Pinning for sure! A few questions about ingredients. I live where there is virtually no dedicated asian supermarkets such as a 99 ranch within a 100 mile radius of me, but I try to have a well stocked pantry of sauces and ingredients. 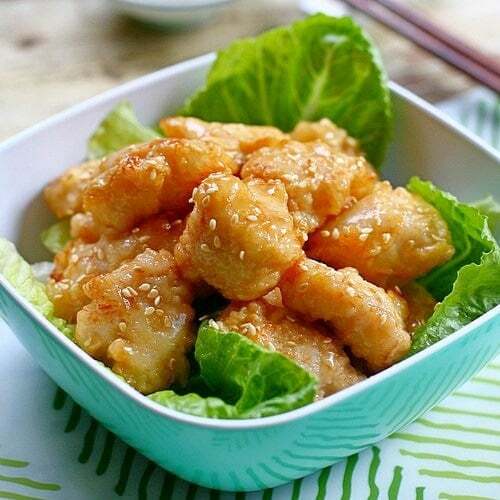 I would really like to make this since it reminds me of what I use to eat as a kid whenever I’d visit Taiwan. Also, are fresh noodles essential to this recipe or can I use dried? Soy sauce and Asian sesame dressing. Went out with some friends a couple of weekends ago and my friend ordered some Dan Dan noodles. Definitely didn’t look half as appetizing as yours, but I totally loved the peanutty flavor of it and I’m going to need to save this recipe for future dinners!! looks amazing! excited to try this! I like noodles and I will make it very soon. when you say “oil” for ingredients? what kind? u also have oil listed under Chili oil? do you mean chili oil for both? When you say to filter the oil, do you mean that you strain it to get out the chili flakes and peppercorns? I tried using peopercorns once but kept them in the dish (I didn’t strain them out) and hated every time I bit into one. So is that the secret? Release the flavour, then remove them? Hi James, correct, you strain and discard the chili flakes and peppercorns. I made this dish tonight. I am very fortunate to live in Oakland, California, so I was able to get the peppercorns from 99 Ranch Market and the noodles (yakisoba) and Japanese condiments from the Tokyo Fish Market in Berkeley. As with all of the recipes I’ve tried from this site, it was DELICIOUS!!! Thank you so much. I like your website, but I really hate how I have to click another button to get the recipe. So much so, that when I’m on Pinterest and see it’s a recipe for your site, I avoid going to it. I feel like it’s just a scam for you to get more pageviews and to make more work for me. You would probably get more traffic in the long run if you took it off cause I can’t be the only one who feels this way. Would be better if all the sauce ingredients in English instead of Japanese since this is malaysia . Mizkan is a Japanese brand for the sauces I used. What kind of red chili flakes can I use? I used red pepper flakes and they burned right away. Also, the noodles. I went to the Asian market and theres about 30 types of noodles. What kind do I use. I saw some one said, Szechuan noodles, but I couldn’t find any packaging that said Szechuan noodles. Can you please help me.